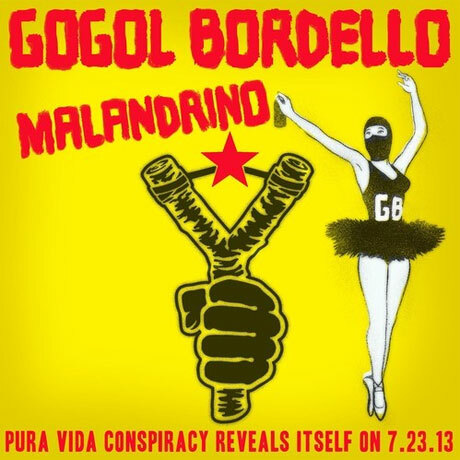 While endlessly energetic gypsy punk crew Gogol Bordello served up "Let's Get Crazy" for last year's UEFA Euro 2012 football championship, the New York outfit haven't issued an LP's worth of fresh material in a couple of years. The band get back in the game this summer, though, via Pura Vida Conspiracy, which drops July 23 through ATO Records/Casa Gogol Records. The band's eighth album, and first since 2011's self-released Моя Цыганиада, was recorded at El Paso, TX's Sonic Ranch Studios with producer Andrew Scheps. While a tracklisting has yet to appear, a press release notes the album is "infused with ideas rooted in Eastern philosophy but also search for a means of joining fragmented parts and persons, and of creating a worldwide consciousness." In a statement, band leader Eugene Hütz added, "For me music is a way to explore human potential… And that's my main interest in life — human potential. Everyone knows there's something inside of us that we're not using. How do we get it? How do we reach it? Every single person knows that there's something and nobody knows what it is. So at one point I said to myself, 'I'm gonna get down and get it.'" You can sample the band's new stop-start anthem "Malandrino," which has Hütz admitting "I was born with singing heart," at the bottom of the page. Gogol Bordello also have a number of global club and festival dates lined up throughout the spring and summer, including a stop at BC's Squamish Valley Music Festival in August. You can find the details below.